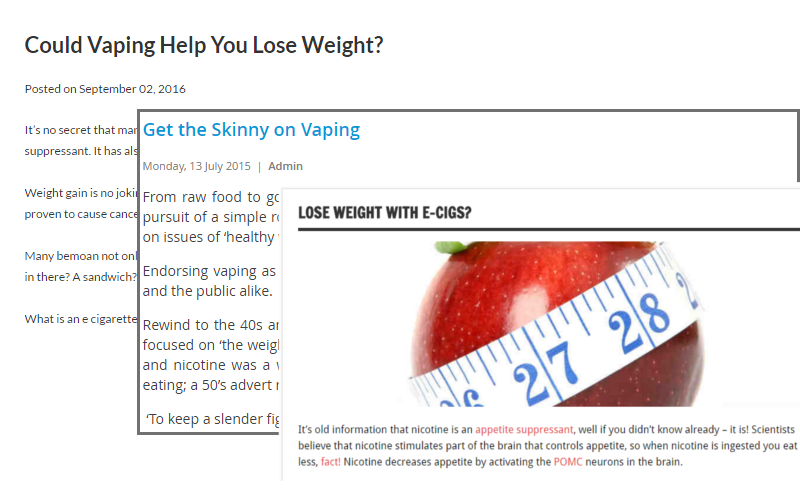 Sciblogs | Vaping: A new weapon in the battle against obesity? E-cigarettes may have a part to play in fighting the growing obesity epidemic, say New Zealand researchers. Electronic cigarettes have been welcomed by some, but not all, public health researchers as a potential new tool to help smokers kick the tobacco habit. Now a new commentary published today in Nicotine & Tobacco Research lays out the case for vaping – using e-cigarettes – as a tool to control appetite and weight gain. The article, titled ‘Could vaping be a new weapon in the battle of the bulge?’ reviews existing research into vaping, nicotine and weight gain, and calls for more research into the public health potential of vaping for weight loss. “Vaping’s use of e-liquids with food flavours, along with the mouth-feel and aroma of the vapour and the hand-to-mouth actions of vaping, could play a role in helping people eat less,” says lead author Marewa Glover from Massey’s School of Public Health in a media release. It has been well established that quitting smoking leads to weight gain, say the authors, and, perversely, this weight gain can come with its own negative health consequences. However recent data from clinical trials of e-cigs, as well as anecdotal reports from petitions, suggest that switching from smoking to vaping can help stave off the kilos that come with going cold turkey. If there is an effect of vaping on weight, is this effect only present in those quitting smoking or can it also be seen in those who are naïve to nicotine? Such questions could be explored in human laboratory experiments involving both smokers about to quit and never-smokers. Clearly, such research would not be without controversy. It could be considered unethical to introduce naive users to nicotine, a potentially dependency forming substance. Short-term nicotine vaping is unlikely to lead to nicotine dependency or tobacco smoking and should be sufficient to determine at what level an effect on appetite may be detected if at all. Vaping is not considered harmless even without nicotine, thus introducing current nonsmokers to vaping even without nicotine could also be considered unethical. In addition, there is opposition to vaping among some public health researchers. Their alarm that smokers are switching to vaping, despite the estimated 95% lowered health risk could increase at the thought of nonsmokers being attracted to vaping for weight control if this concept begins to be discussed in the scientific or public realm. The research community, policy makers, and the public need to be aware of the emerging perception that vaping may have potential benefit for appetite and weight control. Independent tobacco experts contacted by the UK Science Media Centre saw potential in the use of e-cigarettes to prevent weight gain in quitting smokers, but were cautious of any suggestions that vaping could be helpful for non-smokers. It is important not to confuse this possible strategy for the prevention of weight gain among people who are trying to quit smoking with strategies for non-smokers who are trying to lose weight. There is no evidence that e-cigarettes would be helpful for weight loss, a process which requires far greater control over food intake than the prevention of weight gain. As the authors themselves caution, it would not be advisable for non-smokers to start using nicotine, given its highly addictive properties, or to expose themselves to the potential long-term risks of vaping. 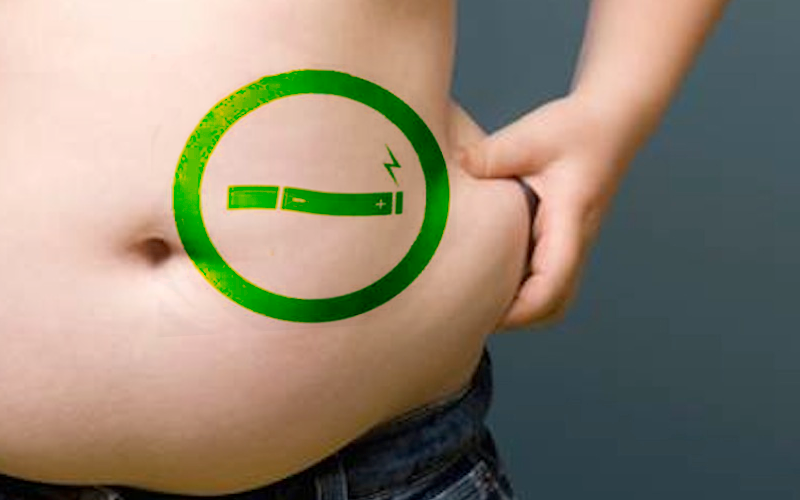 In the absence of direct evidence about the impact on weight of vaping with food-flavoured e-liquids, caution is warranted over any suggestions of their weight loss properties. Studies are now needed to assess their potential for harm as well as good.